As the line to 10 Conditions of Love sprawled out the front of Melbourne's Town Hall and ran a full city block up to Russell St, China's decision to oppose the film's screening was looking like the best publicity the could hope for. Without all the hackings, this 54-minute film might have got a limited release and only appeared late-night on SBS. 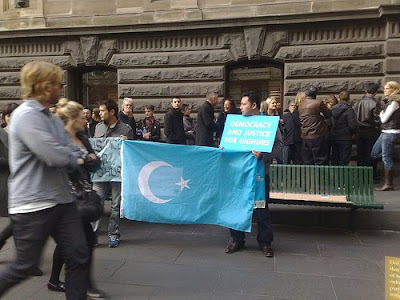 Instead the flag of East Turkestan appeared on national and international news, international film festivals are saying they'll pick it up and Australian politicians are supporting a national struggle they may not have heard of two months ago. Festival director Richard Moore kicked the film off saying "How sweet it is to push play this evening". The film itself follows the life of the Uyghur's most vocal proponent, Rebiya Kadeer, who was imprisioned in China for her actions. It uses the limited footage that has come out of the western province of Xinjiang (New Frontier) intercut with interviews with Kadeer herself. One film-goer remark on the way out "It's nothing that you couldn't see on Dateline." He was clearly taking the festival's "Everyone's a critic" tagline as an invitation. But timing is crucial and this is a film that came out just as the Uyghurs were subject to some of the worst violence "in the country since Tiananmen Square". China has been keen to highlight Xinjiang's Islamic population and make connections to terrorism. Just this morning a plane from Afghanistan flyng into Xinjiang was turned back after a China claimed the airline was victim of a bomb threat - though later AP reports that there was no threat. As Kadeer said following the film "It's the Chinese Government that politicised this, the film, and I think the media plays a very important role in basically highlighting our situation and covering our situation, so I'm very grateful for the coverage." She was joined on stage by Labor MP, Michael Danby name-dropping the Dalai Lama, who supports Kadeer as a non-violent leader. And finally Greens Senator Bob Brown said he was looking forward to the next official visit of the Chinese president "so that we can take it right up to him in Canberra, that it is time for your family and the people of East Turkistan to be free". How Kevin Rudd will echo this sentiment in Mandarin is the real diplomatic challenge.